A Python Dictionary is a collection which is unordered, changeable, and indexed. Unlike string, dictionary is mutable so, dictionary can expand or sink as per the requirement. TIP: You can also place one dictionary inside another and list inside a dictionary. Or you can use dict() keyword. We can access the Dictionary values using their keys. This can be done by placing key inside the square brackets, or using get function. TIP: If you access non-existing key, get function with return none. Where as, placing key inside the square brackets method will thrown an error. Remember, dictionaries are mutable so, you can insert or update any value at any point of time. Use below syntax to insert or update dictionary values. If key is present in the dictionary then it will update the key value. If Dictionary_name doesn’t have the key then it will insert the new key with given value. The pop method remove the value at a given key, and prints the removed value. popitem() will remove the last inserted item (key, value pair) from dictionary. The del statement will remove the value at specified key. If you miss to provide the key then it will completely delete or remove the given dictionary. The clear() statement will simply clears the dictionary items. The Python For Loop is the most common way to traverse the dictionary items. Following statements will help us to iterate, and print the keys inside a dictionary. Following statements will help us to iterate, and print the values inside a dictionary. 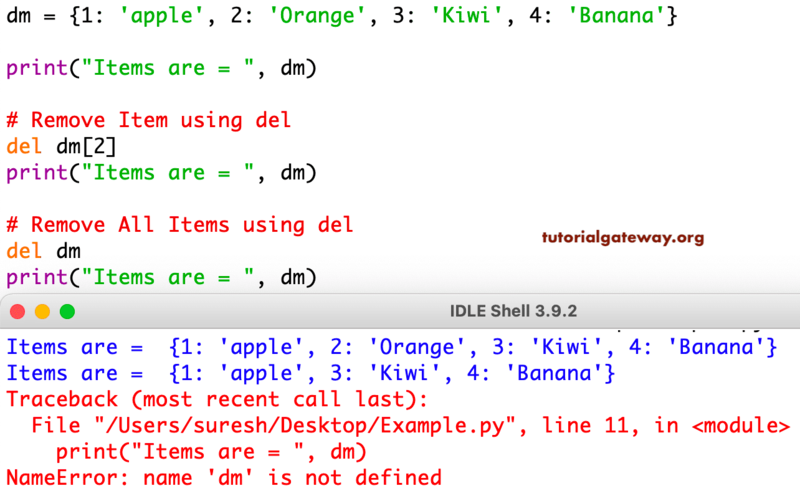 In Python, you can use items inside the for loop to return dictionary keys, and values. This is very useful to access the individual dictionary items. fromkeys() – Returns new dictionary.Where, keys starts from sequence, and values equal to values. get() – Returns the Value of a Given Key. pop() – Remove and prints the value of a given key. popitem() – Remove and prints the last inserted key-value pair. setdefault() – If given key is present in the dictionary then, it will return its value. If not, this function will insert key with given value, and prints that value. update() – Update the Key-Value pair of a Dictionary. The following methods are common methods which can used on Lists, Dictionaries, Tuples. The Dictionary min function is used to find the minimum value among the given list items.